It was a blistering hot day in George Town, Grand Cayman. This groom and his friend, pictured are both postal workers in Arkansas. He told me his friend suggested that Grand Cayman might be a good place to get married, when the two couples were on a cruise vacation. Since they had a great time at My Secret Cove, I think this Grand Cayman wedding was unanimously voted a success. Below is the quiet spot, not far from the George Town cruise landing, known as "My Secret Cove." 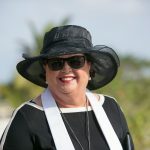 Fortunately it does provide some shade these days, but I try and do my cruise weddings as early as possible, before it gets really hot. 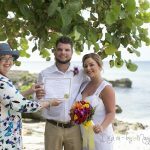 My clients help by scanning and emailing their documents in advance so that it is very easy to get the Special Marriage License which is required for visitors to get married in Cayman. The Bride chose a special reading from e.e. cummings to read to her groom "I carry you in my heart". Iced champagne is part of this all-inclusive cruise wedding package, seen here the newly-weds and their friends raise their glasses in a toast. This is a private residence near My Secret Cove, but it makes a great back-drop for this formal portrait. This quiet spot is my favourite by far. It is not available for groups larger than 6 people. 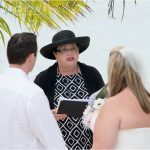 How It's natural beauty adds to the special quality of your wedding day in the beautiful Cayman Islands. This spot has it all, beach, rocks, water, greenery all allow for some fantastic wedding pictures. 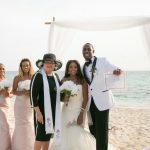 For your unforgettable, worry-free, wedding day on one of the gorgeous beaches of Grand Cayman Island, call Joy or Peggy today at +1 345-9499933 or email mywedding@candw.ky.